Great gifts for your Groomsmen from WhereBridesGo.com! Gone are the days when wedding planning was the sole responsibility of the bride and her mother. If your fiance is happily going about his life while you are out alone talking to the florist, caterer, baker, stationer, DJ, etc., it's time to get him involved in the planning of what will be the most special day of your lives together—your wedding day! After all, planning this day will probably be the first major project of your life together. It's important for both of you to feel connected to this process. Here are the top 10 ways to include your man in planning for the big day. Request His Help. This may sound like a "no-brainer," but often the groom doesn't get involved because he has been under the mistaken impression that his help wasn't desired. Sit down with your fiance and ask him what he would like to have at the wedding/reception. Tell him what you would like and develop a plan together. Give Him The Knowledge. The fact that almost every bridal magazine is directed at brides is not lost on your fiance. He may be hesitant to help with planning because he simply doesn't know what's expected of him. Give him a checklist with dates that tasks need to be accomplished. Offer suggestions for each area. Remember, he may not do things exactly the way you might, but that's okay. He's getting the job done. Enticements. Finding the most delicious wedding cake or most bubbly champagne can be a good way to have your fiance have input into the wedding plans. Spending a few afternoons or evenings eating delicious desserts and sipping on champagne isn't work; it's fun! Gift Registry. Remind your man that the gift registry isn't just for china and crystal. While he may genuinely care about those types of gifts, today's gift registries are much more diverse. If he's had his eye on a great barbecue set or barware, remind him that the wedding gift registry is the way to go. Entertainment. Choosing the entertainment for your reception may be just the ticket for getting your fiance involved. Chances are he has very definite opinions in this area. Put those tastes to good use. Have him "audition" the various bands or DJ's your considering. Spending a few evenings together going to clubs listening to music is a date not wedding planning! Invitations. Chances are you haven't met everyone in your fiance's family or group of friends, yet it is important that they be included in the guest list. Ask him to make a list of people he wants to invite. Better yet, ask him to address the envelopes of his guest list. Don't worry if his handwriting is illegible, there are many computer programs available for printing labels. Keeping Track. If your fiance is a natural organizer, ask him to keep track of receipts, schedules, contracts, and appointments. Not only will this lighten your load, but also he'll be involved in the planning process. Accommodations. Asking your fiance to arrange for accommodations for out-of-town guests can be a good way for him to stay involved. Just give him a list of acceptable hotels, and let him do the arranging. Rehearsal Dinner. Your fiance probably knows that this dinner has traditionally been the groom (or groom's family's) responsibility. If he doesn't already have ideas for this event, give him a few suggestions, and let him have at it. Don't worry if his ideas of fun for all differ from yours. It's his wedding, too! Honeymoon Planning. If your guy doesn't already have a plan for your honeymoon, give him a few suggestions. Let him know the type of hotel you would find acceptable and be prepared to be pleasantly surprised. Enjoy the wedding planning process .... together! 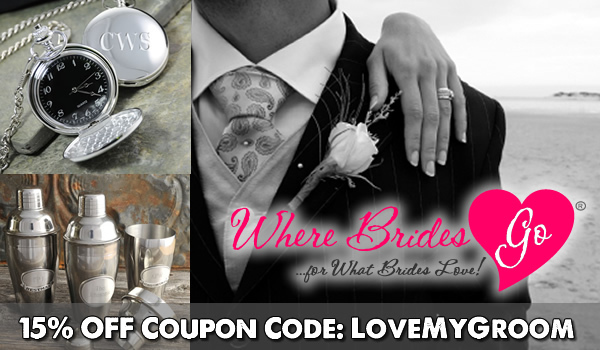 Take 15% off your entire order at WhereBridesGo.com with coupon code LOVEMYGROOM, plus get FREE SHIPPING on orders over $100. For a great selection of affordable groomsmen gifts, wedding cuff links, and wedding cake tops, check out WhereBridesGo.com!